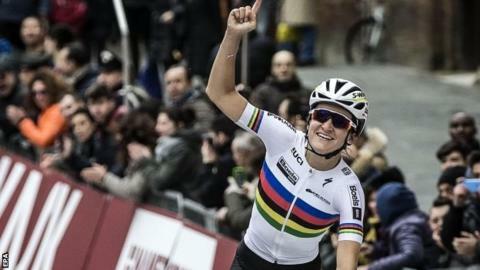 World champion Lizzie Armitstead has won the opening race of the new women's UCI World Tour - the Italian one-day classic Strade Bianche in Tuscany. The 27-year-old Briton was part of a three-rider escape and accelerated away up the final climb to the Piazza del Campo in Siena to win by three seconds. "We shared the work in the last 10km and I pulled away on the climb. It worked out really well," she said. Armitstead began her season by winning last weekend's Omloop Het Nieuwsblad. "After winning in Belgium last week, thankfully I'm not affected by the curse of the rainbow jersey," the Boels-Dolmans rider added. Poland's Katarzyna Niewiadoma (Rabo Liv) was second, with Sweden's Emma Johansson (Wiggle High5) 10 seconds further adrift after the 121km race, much of which takes place on gravel roads. The World Tour consists of 18 races throughout the year and is a mix of one-day and stage races. It replaces the World Cup which was a series of 10 one-day races. In the men's race, Switzerland's Fabian Cancellara recorded his third victory, narrowly beating last year's winner Zdenek Stybar with Gianluca Brambilla of Italy third and world champion Peter Sagan fourth.